New Equipment Counters are added from the Counter screen. An increased permission level could be required. If the user has the appropriate level of permission, an Add (+) icon should be visible in the toolbar at the bottom of the screen. Tap this icon and the 'New Counter' dialog screen will open. Select a vessel from the drop down list. Enter the equipment name from which the counter is going to be read. The sort order when updating the counters is by vessel and then equipment. It is important when entering the equipment name to remember the sort order. Counter and Fuel / Day Estimates are important as they are used in the average calculation for Maintenance Due predictions. 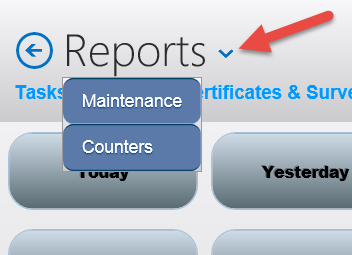 After saving the 'New Counter', refresh the Counter screen to check that the new entry is in the correct position/order.